← My very first book chapter! For several reasons I’ve been thinking a lot about my role as a supervisor of PhD students lately. I currently supervise 2 PhD students, and most of what I do as a supervisor is based on experience of having been supervised myself as a PhD student. Since I teach a lot at our master programme in health informatics, I’ve studied pedagogy (as has been reflected in this blog), and I supervise many master students through their thesis work. The supervising of PhD students do however have a very unique context and the relationship between the supervisor and the student is also very special (whether good or bad). One of my PhD students just yesterday had a paper accepted after only minor revisions and the pride I felt was almost ridiculous. Anyway, my own thoughts about supervision led me to take a course in “pedagogy for doctoral supervisors” – and one of my assignments was to choose a picture that I felt represented me as a supervisor. After some soul searching (and searching through photo albums) I picked this one. I chose this picture of a friendly and knowledgeable guide as my view of myself as a PhD supervisor. I think supervising PhD students is very much about guiding them through a new world, and a new culture. In order to feel safe when you enter this world, you have to be able to trust your guide, both when it comes to the knowledge they have but also that they will tell you about unspoken rules and regulations in this new setting. 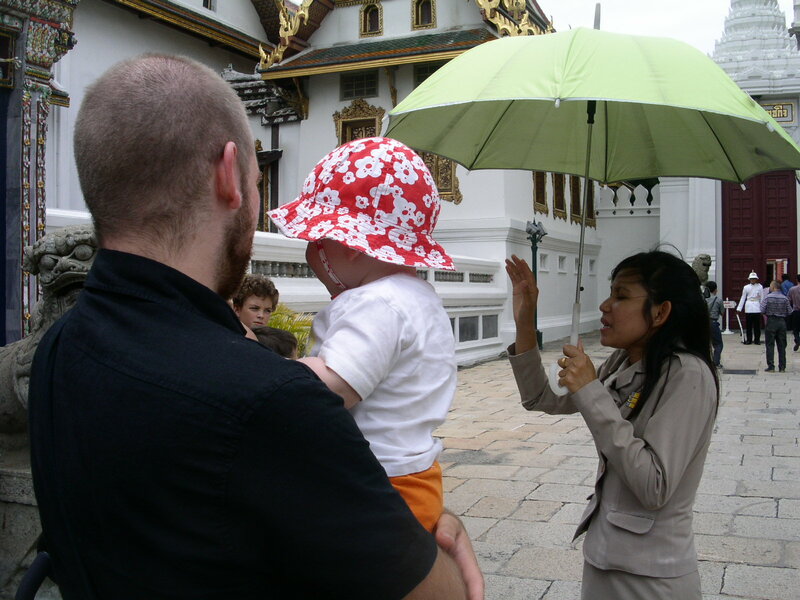 Being this guide requires structure (meeting places, deadlines), but also allowing freedom to explore (everyone needs some time to enjoy the grand palace on their own, right?). I may not always be able to answer all questions asked, but I’ve been down this road before and I can help you find the answers on your own. I hope to make the experience a pleasant and inspiring one, even when the weather is really a little too hot, and the 9-monthold baby have lost interest a long time ago… but I am also aware that the experience is ultimately yours and all tourists/PhD students have their own preferences, personalities and background knowledge. This entry was posted in Teaching and tagged Supervising doctoral students. Bookmark the permalink.